Hurricanes Irma and Maria devastated Puerto Rico in 2017 causing catastrophic damage. Life is still far from normal for so many affected communities and their residents. Recovery is difficult for hurricane survivors given the extent of destruction and the many obstacles to getting back to normalcy. Financial resources for the massive reconstruction are limited. Please help these small communities recover and prepare for the future, by funding travel expenses of GISCorps volunteers that will provide them with maps to aid in recovery planning. · Where are critical natural resources that need protection? · Where can agricultural rebirth be located? Updated mapping will help local communities rebuild and plan for future disasters, as well as make important decisions about the sustainability of their communities. 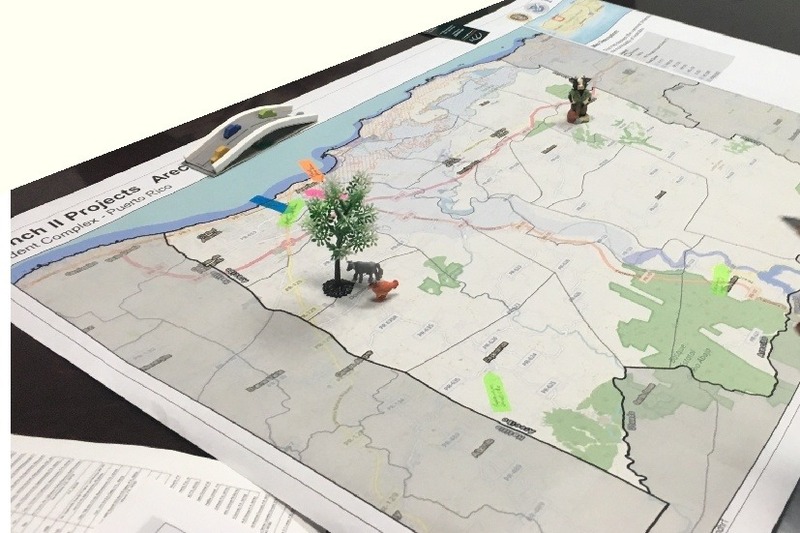 Maps help local stakeholders with economic development planning, natural resource conservation, decision making for safe land use, and improving community health. The teams will be producing maps for printing as well as in an online web map format. Please chip in to help our fellow citizens recover and prepare for the future. No donation is too small. URISA’s GISCorps will provide teams of volunteers that will spend two weeks on the ground to assist local communities in need of mapping assistance. Volunteer teams of two to four GIS professionals will work with identified communities to provide custom services depending on their needs. These communities will be identified in partnership with FEMA Community Planners and the local governments they are assisting with recovery. This will include the consideration of services that are being coordinated with other organizations and local resources on the ground. GISCorps coordinates volunteer-based, short term, highly specialized GIS service projects to underprivileged communities. GISCorps has completed over 240 missions in 71 countries. More than 1,700 volunteers have participated in these missions, contributing over 70,000 hours. Learn more at https://www.giscorps.org. We hope to get GIS professionals to Puerto Rico before close of this hurricane season on November 30th. Many of the specifics regarding mapping, beyond our GoFundMe page descriptions, are to be determined once on the ground in Puerto Rico. The mission is more than just maps, a key goal is the community planning and other stakeholder actions developed collaboratively with the local communities, the Puerto Rican government, and FEMA. Using GIS mapping and analysis in planning for natural disasters, identifying mitigation opportunities, and assisting in recovery, is at the core of this mission. There are no links to grant applications. The applications were populated with the GoFundMe page information, placed into the format of the grant application and included documentation related to URISA, 501(c)(3) status, etc. We are re-doubling our efforts to keep our mission moving forward. Many, many grant applications have been unsuccessful. We are committed to getting this project going and we may need to downsize the scope, but rest assured we are going to make an impact. Today is #Giving Tuesday, a day that celebrates generous and selfless giving to others. Please consider supporting URISA's GISCorps on this #GivingTuesday! Please share on your social media, re-post, or add a small donation today to the CommunityMaps4Puerto Rico mission! I wanted to send out an update on our campaign that you all have generously donated to. We are busy submitting grant requests to many philanthropic organizations to move this important campaign forward. Thank you again for your support, your donations have confirmed that empathy trumps indifference in these difficult times.